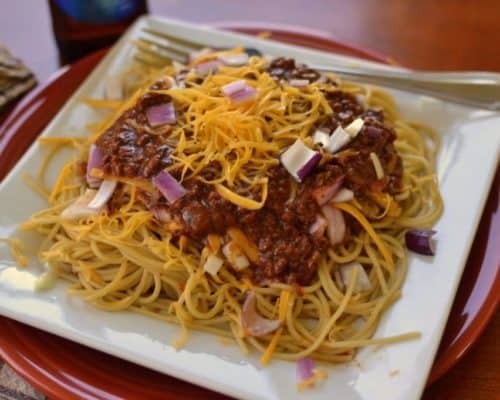 Cincinnati Chili is a unique culinary experience combining ground beef, onions, garlic, tomato sauce, and chili powder with cocoa, cinnamon, cloves, allspice, brown sugar, and vinegar. The ending result of this unusual chili is a most enjoyable taste bud exploding experience. You really need to experience this chili. Cincinnati chili originated with immigrant restaurateurs in the 1920’s who were trying to expand their customer base by moving beyond narrowly ethnic styles of cuisine. Ingredients for this chili might include ground beef, stock, tomato paste, cinnamon, other Mediterranean spices and sometimes chocolate in a soup-like consistency. Toppings include cheese, onions, and beans. How do you make Cincinnati Chili? This chili is so easy to make. First simmer your ground beef and beef broth. Make sure you skim off any fat that floats to the top. Saute your onion and garlic in a separate skillet. Add the sauteed onion and garlic, tomato sauce, barbecue sauce, chili powder, cocoa powder, ground cinnamon, ground cayenne pepper, ground cloves, ground allspice, cider vinegar, tomato paste and brown sugar. Simmer uncovered for 2-3 hours. Finally serve over cooked spaghetti with shredded cheddar and finally diced onions or however you like to garnish it. 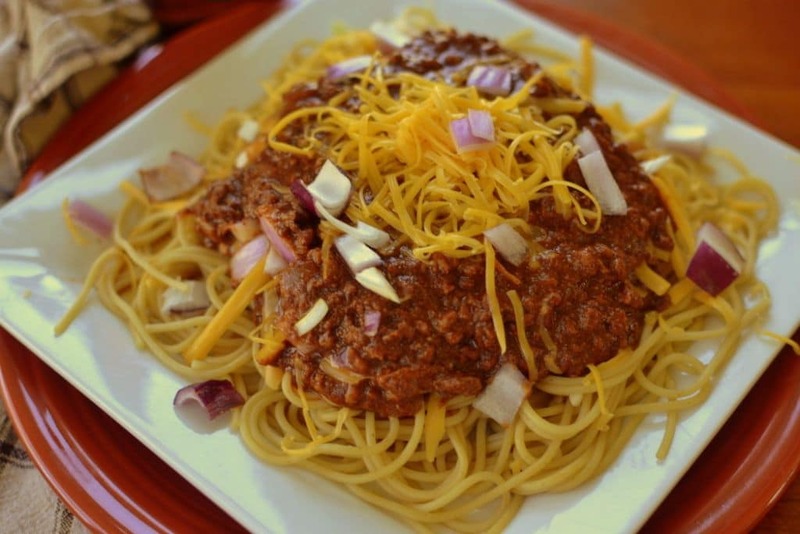 Ways to serve Cincinnati Chili. Two-Way Chili – The chili mixture is served on spaghetti. Yummy! 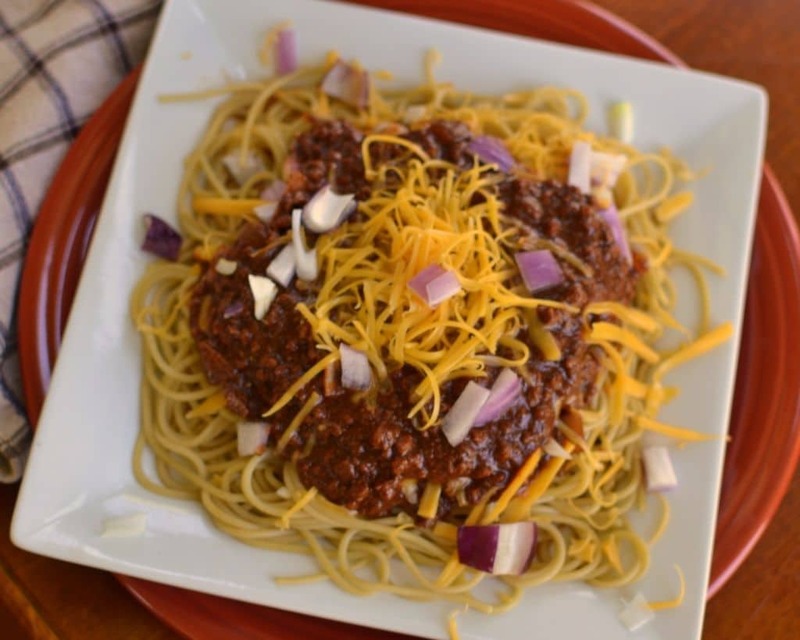 Three-Way Chili – Top the chili and spaghetti with shredded cheddar cheese. Super yummy! Four-Way Chili – Top the whole caboodle with onions. Oh my heavens! Five-Way Chili – Top the whole kit and caboodle with kidney beans! Heavens to Betsy! This is a weekend meal as it needs to simmer in the Dutch oven for several hours. However it is well worth the time and the effort. It is just that good! Cincinnati Chili makes for awesome leftovers. This is one of those dishes that tastes even better the next day as the flavors have all had time to meld with each other. Other ground beef recipes you will love! This post was originally published April 4, 2016 and was republished September 5, 2018 with new information. 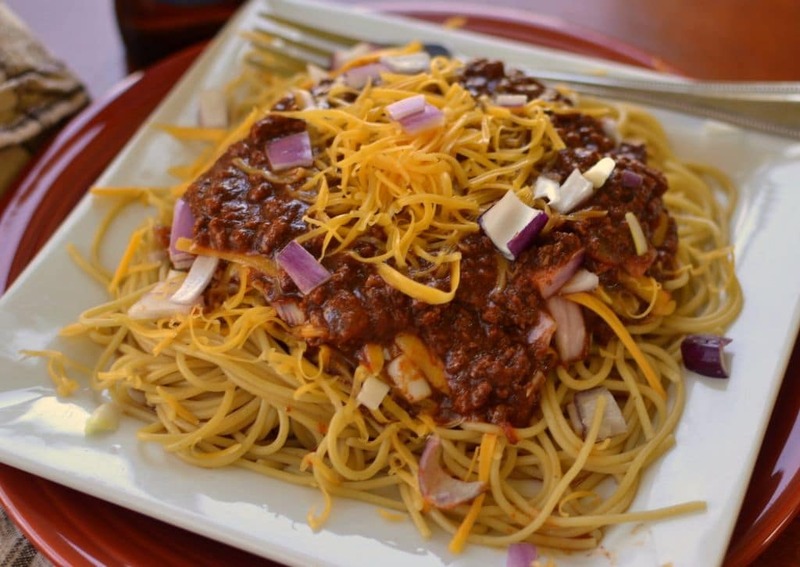 Cincinnati Chili is a unique culinary experience combining ground beef, onions, tomato sauce, and chili powder with cocoa, cinnamon, cloves, and allspice. 1/2 cup finely chopped red onion. Combine beef broth and beef in large heavy stock pot or Dutch oven uncovered. Bring to a low boil and then reduce heat and simmer for 30 minutes. Skim off scum and fat that floats to the top. In small skillet melt butter over medium heat. Add onion and saute until soft adding garlic that last minute of cooking. Add cooked onion and garlic, tomato sauce, barbecue sauce, chili powder, cocoa, cinnamon, cayenne pepper, cloves, allspice, cider vinegar, tomato paste and brown sugar. Simmer uncovered for 2-3 hours. Serve over cooked spaghetti. Garnish with cheddar and onions. Oh my I haven’t had Cincinnati Chili in years! I used to order it at Steak and Shake when we live in Missouri…of course that stuff isn’t very authentic. I’ve never made it myself but this recipe looks too good to pass up! Love the addition of cocoa powder. Talk about depth of flavor! Yum!